Construction of all kinds lagged significantly behind the activity in the first half of last year. 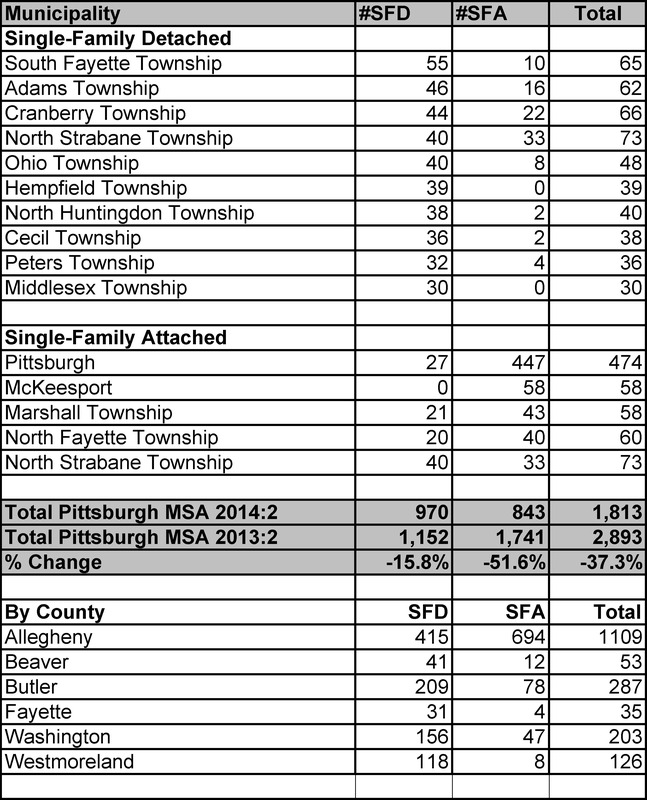 Housing starts in Pittsburgh plunged 37.3 percent in the first half of 2014 compared to the same period in 2013. The drop in activity was driven by a significant drop in apartment starts coupled with a downturn in single-family permits that is attributable to weather and market conditions. New home construction is still lagging the pent up demand for housing of all kinds. Some of the decline in starts can be explained by the severe winter, but much of the decline is due to the profile of the custom builder and the lot shortage in Metro Pittsburgh. The average builder is smaller here than most markets and it’s difficult for smaller builders to catch up when weather holds down buying for an extended period. More importantly, the dominant share of NVR’s Ryan/Heartland brands has made it very appealing to develop new lots for that juggernaut and unappealing to develop traditional neighborhoods that feature multiple custom builders. Total residential starts fell to 1,813 during the first six months of 2014. Because several large multi-family projects got underway in the second quarter of 2013, the year-over-year comparison reflects a steeper decline than the Pittsburgh market might normally support. With another 2,000 units in the multi-family pipeline, permits for attached and multi-family units will still top 2,000 units for the full year, a total that is roughly 25 percent above the historical norm. The top municipalities for residential construction during the first half of 2014. Demographics are really behind this part of the market. For as many apartments as have started since late 2012, leasing remains brisk, even accelerated compared to 2013. Nonresidential contracts reached only $1.02 billion from January to June 2014, down 29.7percent from $1.45 billion during the same period in 2013. The pace of activity seems to be finally increasing, although the market is nothing like the boom of construction that took place after the last recession. Because of the cold winter and slow spring bidding, there is little expectation of a significant turnaround in 2014 but the pipeline is filling up with projects that bode well for 2015. Jobs like CMU’s Tepper School and the Cohon Center, the next phases of Bakery Square 2.0 or the Three Crossings are some examples of projects that will get underway in the next six months. The big trigger will be the Shell cracker in Monaca, I believe. There are bigger industrial users looking for space now but the demand for manufacturing and industrial space will explode once plans for the site are announced. Jacobs Engineering took bids on some early packages over a week ago and confidence is still very high that work will go ahead by the end of this year on the preparation for the chemical processing facility, even if only to prepare it for Shell to sell to another producer. That prep work should be in the billion dollar neighborhood.